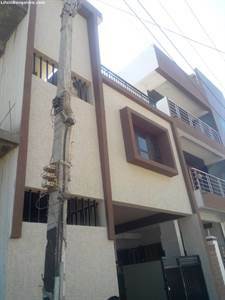 Newly Built North Facing 2BHK+2BHK Independent House for sale in Hennur Road near to Cafe-Coffee Day and St,Michael School. This house inside a fully developed layout and about 5kms from Manyata Tech Park. The House is in a fully developed locality with good water and power facility, and all other amenities like Shopping Complex, Bus Stop, Auto Stand within walkable distance. The houses have separate entrance and is suitable for 2 families or rental income purpose. The Expected price is Rs.79 Lakhs Negotiable.